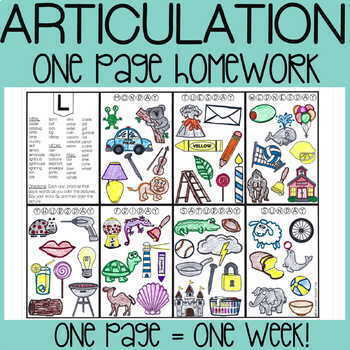 This speech therapy homework is ONE PAGE for SEVEN DAYS! Your students will love to color the daily pictures as they practice their sounds. Easy for print-n-go access to send home for carryover. Word lists include all positions of words. Perfect for all year long! 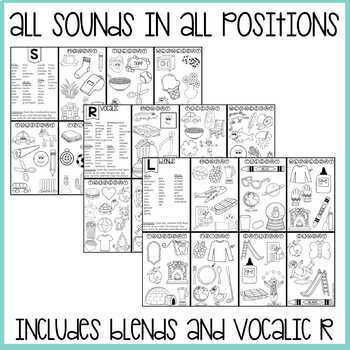 This resource includes ALL sounds in ALL positions (including S Blends, L Blends, R Blends, and vocalic R). Includes 7 days of the week. Includes a variety of target words per sound (varies each sound). 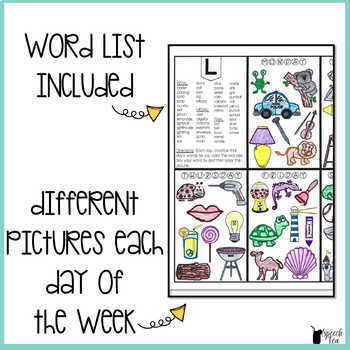 Student will practice target words and color the pictures for that day of the week. Homework is finished when all days are completed! If you like these, check out the Phonological Processes Homework Color Sheets!